Choosing a domain relevant to your business is essential. Your customers and potential customers will find you much easier online. Depending on your target audience, DirektHost give you the possibility to register multiple domains. We have a partnership with one of the largest companies in the domain registration area, which contributes to the quality of our services. A domain can be registered for a year with extension possibility. Payment can be made online by credit card or bank transfer. All bookings are made only on the customer name. Register now a domain: .com, .net, .biz, .info, .mobi, .co.uk, .us with prices started from 5 Euros/year + VAT. Throughout the collaboration, every customer benefits from free technical support 24 X 24 !! 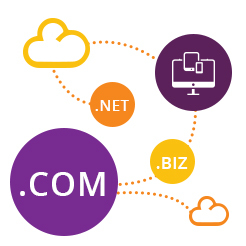 Do you have any questions about domain registration?